Dear friends, As you surely know, presidential elections held in Belarus last week resulted to be undemocratic and unfair, according the people domonstrating at Minsk main square and other cities. Demonstrators are seen to be flying the former Belarusian tri-band w-r-w flag, while others are flying Georgian (the new one of course), Ukranian and Polish national flags, in addition of the EU's. Here you are three gifs of flags I have seen in many photos from the web, yahoo!news, cbc new, bbc news, and others. Those flags are interesting in my particular point of view, since they are all but tri-band, instead, the first image bears a transparent black-outlined shield charged by a black double-beamed cross -Lorraine cross- (surely that shield featured in the Pahonia -on the knight's shoulder-), the whole over the intersection of a "scandinavian" red cross on a white field; and the second image is also white with the red scandinavian cross, in the canton is the shield charged by the cross. A third flag is the triband only charged withe the whole Pahonia (emblem in gif image taken from http://www.belarusguide.com/as/history/pahonia.html ). Klaus-Michael Schneider, 16 May 2006. The Belarusian Resistance must be very similar than Belarusian Nationalist Mouvement, or even part of it. The official flag used by Belarusian Resistance is exactly like the Belorussian Nationalist Mouvement one , but, according to Belarusian Resistance's website (<www.rubon.org>) they are using other flags too like the tricolor one plain horizontal white,red and black stripes. Flag of Belorussian Nationalist Movement can be seen at <members.odinsrage.com/rubon>. Taking a look at the Belarus Nationalist flag, it's worth noting that the double-armed cross at the center of the device was also used as a collar tab for Waffen-SS personnel of the Waffen Grenadier Division des SS (russiche Nr. 2), which apparently was made up largely of Belarusian recruits. I can't speak or read Russian/Belarusian (apart from transliterating the letters), but the English page looks very racist. See: <members.odinsrage.com/rubonl> for their "key concepts of nationalism". I guess "nationalism" is the new code word for "racism". John Evosevic report is not correct. The symbol itself -- six-ended white/silver cross, usually on red shield -- is known from medieval era. In Belarusian culture it is named "Cross of Yaryla". "Yaryla" was the name of solar deity in ancient Slavs panteon, the cross itself is considered to be transformed solar symbol. This cross was wielded by a horseman on coat of arms of medieval state comprising modern Lithuania, Belarus and Ukraine (Grand Duchy of Lithuania, Ruthenia and "Zhamoyciya"). The coat of arms itself is named "Pagonia" (Vytis in Lithuanian) and both cross and coat of arms are part of common cultural heritage of Lithuania and Belarus. The white/silver outline of this cross (placed horizontally, too) on black (?) background was indeed unit symbol of volunteer unit "30.Waffen-Grenadier-Division der SS (russische Nr.2)/30.Waffen-Grenadier-Division der SS (weissruthenische Nr.1)" formed in 1944. This is also quite similar to the Cross of Loraine, prominent in the flag of the World War II French Resistance, and of course, the Slavic Cross, which has featured in several flags of Eastern Europe. A similar cross is prominent in Greek Orthodox usage as well as Russian Orthodox, although it does not appear on the current flag of Greece. The symbolism is usually explained by saying that the second cross-arm represents the sign "INRI" (Iesus Nazareni Rex Iudorum, with apologies for my poor Latin spelling) over the head of Christ, or the footrest, or both. Is there a similar rationale for the Belarus/Lithuanian solar cross? Is it Christian or pagan in origin? The Cross of Yarla is of pagan origin, as explained in the article. But as Lithuania and Belarus were Christianized, the Cross of Yarla was also made acceptable as a Christian symbol, or probably, a national symbol. The Cross of Yarla's two crossbeams are of equal length. And the length of the vertical beam is made of five quantities to the crossbeams' three. The Cross of Lorraine is a Latin cross, with an additional upper crossbar. This two-armed or two-barred cross (sometimes both bars are of equal length) is called a patriarchal cross in the Latin Church and is a symbol of rank for the bishop carrying it. Archbishops were entitled to use this cross. And the cities in which Archbishops usually presided were often given the right to use that cross in various places. The Cross of Lorraine is part of the arms of Hungary and Slovakia, due to historical ties with royal families. Sometimes the two horizontal bars of the Cross of Lorraine are of equal length, other times, the upper bar is shorter than the lower bar. The Slavic, or Orthodox or Russian Cross is of three bars, the top being shorter than the middle and the bottom bar being slanted with the left side higher than the right (as you look at it). The top bar was for the sign board, the center was for the arms and the bottom was a footrest, contorted when Christ was stabbed with the spear. The upper two bars are above the center of the cross so that there is a greater distance between the lower bar and the middle bar, compared to the distance between the upper bar and the middle bar. Ukrainians use the three bars but all are horizontal, and in some instances, the top bar goes to the top of the Latin Cross, with nothing of the vertical bar protruding from the top. Some Roman Catholics of the Eastern Rite use the three-barred cross, and the upper and lower bars are a bit longer than the Russian or Ukrainian crosses, and are equidistant from the middle bar. "...following the merge of the Belarusian Patriotic Youth Union and the Belarusian Youth Union (the legal successor of the Belarusian Komsomol), a powerful youth organization was created - the Belarusian National Youth Union (BRSM)." UCP flag is red logo (horse in oval) on white as seen at <ucpb.info> and other photos in the site. 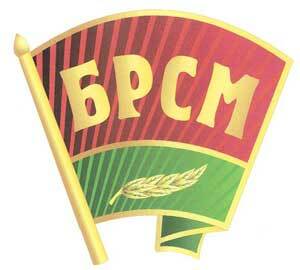 United Civil Party (UCP) is a leading liberal conservative party in the Republic of Belarus. It was established on October 1, 1995 as a result of merger of two like-minded parties - United Democratic Party (formed in 1990) and Civil Party (formed in 1994). We stand for an independent sovereign Belarus that pursues domestic and foreign policy according to its national interests. 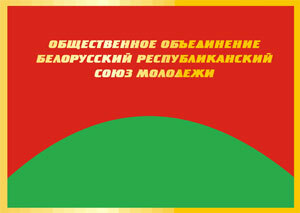 The flag of United Civil Party was published in Flag Report 6 reported by A. Basov, from the register of Belarus where the party and flag was registered on 14 August 1996. 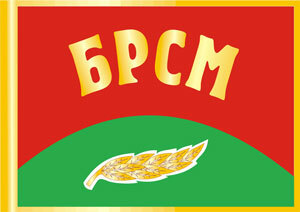 Flag of United Civil Party (Ob``edinennaja grazhdanskaja partija) is according to drawing of A. Basov (Minsk, Belarus). There is also a youth branch called Civil Forum that adopted its flag on 14 May 1997. Flag of "White Legion" movement. Source: letter of A.Basov from Minsk (Belarus). In reports of German TV ZDF, I could see different flags of the political opposition group "Bison" (a European buffalo, living in Belarus and Poland) in Minsk/Belarus. One was hanging in one of the HQ at the wall. It was black with a side view silhouette of a white Bison in the center. At the right and the left side were thin vertical white-red-white stripes. Other flags were shown at a demonstration, yesterday in Minsk. Again the white Bison, but on different coloured backgrounds. I saw red, light blue and green variations, all without the white-red-white-stripes. I found the homepage of the Bisons (Zubr): <www.zubr-belarus.com>. Yesterday was a report of the Belarus election in German TV ZDF. After the publication of the results was a short-living demonstration against president Lukaschenka (Lukashenko). Again, there was a flag of ZUBR, the opposition group. Again a little variation. A black bison on a white field. I saw some blue flags, too, but I couldn't see any details. I saw this or similar footage on "The World" on BBC4 tv on 19 October. The former white-red-white triband was also used. On the new demonstrations taken place in the moment in Minsk was a new ZUBR-flag to see: by}zubr8.gif Maybe it was inspiried by the EU-flag. A yellow bison in a yellow circle on European blue. Size 1:2. Since 1995, an union of Russia and Belarus (sometimes including other Slavic and/or ex-Soviet countries) has been repeatedly proposed by Belarusian president Lukashenka, and was received with moderate enthusiasm by the Russian presidency and by the successive cabinets. The vexillological implications of the projected union remain unknown. 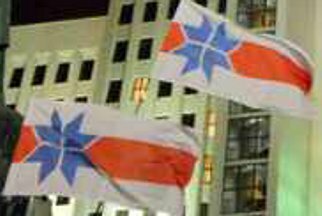 Two flags reported to be used/proposed by the RU-BY Union. The flag drawings were made by me, but the images were made from Victor Lomantsov's website. Both flags have a red background, two yellow/gold stars (showing the union), and both are 1:2 ratio. The ideas came from the Soviet flag, and which both countries used to belong to from the start. The only difference is the type of stars used, and the placement of them. The first one is where the stars are side-by-side, and are colored in full. The second one is where one star is above the other, and the Soviet star design was used. Even though the central government will have flags to represent the Union, each country belonging to the union can keep their current symbols, which most are USSR related (Belarus flag, coat of arms, anthem; Russian anthem). The Russian/Soviet anthem will be used for the Union anthem, and no coat of arms is in the works as of this time. At the first meeting of the Union Council, Alexander Lukashenko sang the anthem, everyone joined in, and selected the tune of the USSR/Russia anthem. New words will be set in place soon. This Opposition Party flag = former Belarus / Gudija flag (white / red / white) with Baltic 8-point star is found at http://www.youtube.com/watch?v=qdroiJJhGzA&feature=related @ 0:43 minutes. Another image can be found at http://www.opendemocracy.net/od-russia/david-marples-uladzimir-padhol/belarus-most-peculiar-election.